TOTAL FUNDS: 52,033.45 ZAR to Gift Of The Givers Foundation (GOTG). Yemen and Somalia have the highest malnutrition rates in the world. Over 300 000 children alone are starving in Yemen. Continuous war have left these countries in a deteriorating condition of starvation and destitution. 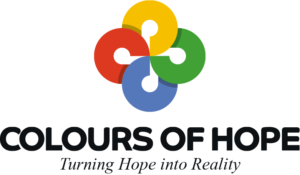 Colours of Hope launched Project Kids Can to assist the Gift of The Givers Somalia and Yemen projects. This project urged schools, and learners to partake in an effortless way to help alleviate hunger in these countries. Over thirty schools and learning institutes in Gauteng were invited by Colours of Hope (COH) to partake in this project. More than 26 schools participated. Donation of funds were transferred on 05 December 2017 to the Gift of The Givers Foundation (GOTG). Mogadishu office received 14 x 20 ft Containers carrying different types of food and medical equipment from GOTG Head Office in South Africa. The Mogadishu logistic office offloaded to GOTG warehouses at Wabari District in Mogadishu, Somalia, Africa. Jacobs thanked COH for their donation of 24,111.30 ZAR for Somalia specifically made during the COH project Kids Can. Food distribution for Internally Displaced People in Taiz Province, Yemen. GOTG team in Yemen distrbuted 1,300 food parcels in province of Taiz to the IDP’s. Each food parcels contains (cooking oil, canned fish, canned beans and rice). The quantity of each food parcel is 48 kg.